Comprehensive Standard PC Power Cord, NEMA 5-15P to IEC 60320-C13, 18/3 SVT, Black 15ft. Comprehensive Standard PC Power Cord, NEMA 5-15P to IEC 60320-C13, 18/3 SVT, Black 10ft. Comprehensive Standard PC Power Cord, NEMA 5-15P to IEC 60320-C13, 18/3 SVT, Black 25ft. 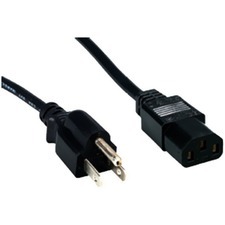 Comprehensive Standard PC Power Cord, NEMA 5-15P to IEC 60320-C13, 18/3 SVT, Black 1ft. Comprehensive Standard PC Power Cord, NEMA 5-15P to IEC 60320-C13, 18/3 SVT, Black 3ft. Comprehensive Standard PC Power Cord, NEMA 5-15P to IEC 60320-C13, 18/3 SVT, Black 6ft.